A visit to a Rangemoors showroom is a must if you’re looking for the very best stoves and range cookers. We have over 100 wood burning, multi fuel, gas and electric stoves and over 40 range cookers in a wide variety of styles and configurations – many of which are on display in room and kitchen settings so you can really see, feel and experience how these products will work in your own home. We are very proud of our showrooms and believe they are well worth a visit for any prospective customer. We have two Showrooms; one in Winkleigh and the other, Hearth & Cook, in Exeter. Our destination showroom in Winkleigh, Devon is the home for many of the finest brands of stoves and range cookers available in the UK and beyond. Stoves manufacturers like AGA, ACR, Charnwood, ESSE, Hunter, Morso, Stovax and Town & Country – all offering the very best in efficiency, quality and design – whether your taste is for the contemporary or the traditional. We’re also proud to have a dedicated area in our showroom for the world renowned French stove manufacturer, Focus Fireplaces, with several live appliances on show, including the iconic Gyrofocus. Our range cookers will impress the most discerning and creative home chefs. Thoughtfully displayed in live kitchen environments, you can see appliances from ESSE, Falcon, Mercury, Rangemaster & Rayburn. From classic traditional cast iron models that will cook and run your central heating, to the most technologically advanced cookers on the market, available in a host of colours and configurations – all designed to take your cooking to the next level. We have recently added La Cornue and Wolf & Sub-Zero products to our list of cooking and kitchen appliances available to see at our showroom, offering a truly international flavour for our customers to enjoy. If you would like to see a more of these products please visit our Exeter showroom, Hearth & Cook. Our Hearth and Cook showroom in Exeter, Devon displays working models of our superb range of Morso Stoves, Wolf Ovens, Sub-Zero Refrigeration, La Cornue Ovens, ESSE Range Cookers, Focus Fireplaces, Morso Outdoor Living and Coldline Life Blast Chillers. A visit will give you the opportunity to get a true impression of how these outstanding products can enhance your home as well as giving you the opportunity to talk to our experienced and knowledgeable team. We are happy to advise you on which appliance will suit your home and talk through any customisation ideas or requirements you have. Choosing a new stove or range cooker that will suit you, your budget and your home should be an exciting and enjoyable process. There are so many to choose from – which is why we encourage customers to visit our unique showroom. A new stove or range cooker will be at the very heart of your home for many years to come so exploring these products at your leisure, guided by our friendly and experienced team will help you arrive at a fully informed decision to the appliance that will best suit your needs and expectations. You will also be able to explore our extensive collection of hearth and cookware accessories that will perfectly complement your stove or cooker. Our team also provides a comprehensive installation service and excellent after sales support so you can buy in complete confidence. For classic and contemporary stoves (including the latest low emission models) as well as our delicious and irresistible collection of range cookers, visit our showroom. We welcome visitors from across the South West – Cornwall, Devon, Dorset and Somerset, so if you are looking for a stove or cooker, come and explore the fantastic range on display at our 6,000 sq ft purpose built showroom. To see our inspirational display of stoves and range cookers please visit our showroom just 2 miles north of Winkleigh, Devon on the A3124. Despite our rural location, access is easy from Exeter or the South West via the A30 to Whiddon Down, then north on the A3124 or from North Devon via Bideford and Great Torrington. Our Hearth and Cook Showroom can be found on Matford, Exeter. Just a short drive from major routes such as the M5 and A30. For contact and address details see here. Our Winkleigh Showroom is open weekdays from 9 am to 5 pm excluding Bank Holidays. At the weekends we are open Saturdays, although during the months of May-Aug, we close an hour earlier at 4 pm. Sundays and Bank Holidays we are closed. Hours may vary during the Christmas period, so do please check before making a journey. We look forward to welcoming you! See our video about Rangemoors and our inspiring products. Watch our video to see what’s in store at Rangemoors and why a visit to our showroom is essential if you’re considering buying a stove or range cooker. Fireside accessories, baskets and lots more. As well our seeing our impressive range of stoves at Rangemoors, you can also find a host of hearth accessories. 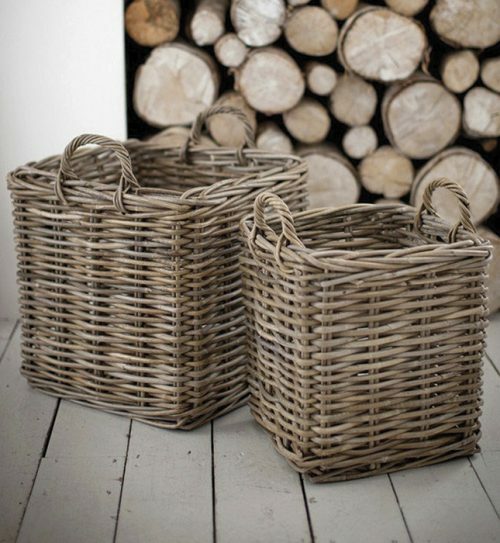 We have a wide variety of log baskets in many different sizes, companion sets, stove replacement parts, firelighters, moisture meters and many more items to help you make the most of your stove and heating.